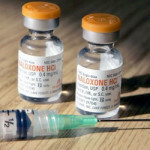 Wilkesboro Comprehensive Treatment Center, the Acadia OTP in North Wilkesboro, North Carolina where Dr. Burson works, was one of the pioneers in distributing naloxone to patients (see http://atforum.com/2014/06/project-lazarus-brings-opioid-treatment-program-to-wilkes-county). The naloxone nasal spray is “easy to use,” said Dr. Burson. It consists of a vial containing the naloxone, which reverses the effects of opioids and can bring someone back from an overdose. The spray comes in a kit with a syringe and an adaptor that squirts the liquid naloxone into the nose. A patient can get the naloxone kit from an OTP, but it’s important for a family member to have it available and know how to use it, because if a patient overdoses, he or she will be incapacitated and unable to use the kit. The first two weeks of methadone treatment in an OTP are the most dangerous for patients, said Dr. Burson. The problem is how to work out the reimbursement details. The cost of naloxone increased about a year ago, with kits containing two doses now costing more than $100. goes to the pharmacy to pick it up. This isn’t ideal, because the patient might not go to the pharmacy right away, said Dr. Burson. However, Project Lazarus has given her clinic many Evzio kits recently. “We have handed out all that they gave us to patients, but that didn’t go through Medicaid,” she noted. Project Lazarus, in Moravian Falls, North Carolina, had a grant to give out free naloxone kits, and many kits went to OTPs. Dr. Burson’s OTP used to receive free naloxone kits for all new admissions. On November 18 the FDA approved the first intranasal form of naloxone. The Narcan nasal spray comes in a kit that includes a dose-measured syringe, and does not require assembly. Kits commonly used by OTPs and first responders are not approved by the FDA, so it’s possible Medicaid will now require use of the FDA-approved version. A second intranasal naloxone product is up for FDA review. Both products were given fast-track designation and priority review. “Combating the opioid abuse epidemic is a top priority for the FDA,” said Stephen Ostroff, MD, acting commissioner of the FDA, in approving the first intranasal Narcan product. “This easy-to-use intranasal formulation will no doubt save many lives,” said Nora Volkow, MD, director of the National Institute on Drug Abuse (NIDA), in a statement. Her agency helped provide the data the FDA used in its approval to show that intranasal administration is equivalent in efficacy to intramuscular administration. “While prevention is the ultimate goal, the drug’s successful development illustrates how public/private scientific partnerships can play an important role in responding to a national crisis, right now,” said Dr. Volkow. Narcan nasal spray is distributed by Adapt Pharma, Inc., headquartered in Ireland, with U.S. headquarters in Radnor, Pennsylvania. Reportedly, group purchasers, such as people in law enforcement, fire fighters, and certain health care workers, will be able to purchase one four-milligram dose for a discounted public interest price of $37.50. Indivior is the other company that has submitted an application to the FDA for an intranasal naloxone spray. Indivor is a spinoff of Reckitt Benckiser, the company that manufactures and markets Suboxone. The only other FDA-approved formulations of naloxone are two injectable products. One is mainly for medical use; it comes as a kit containing a vial of naloxone (the type of vial used in the makeshift kits) and a syringe and needle. This product is typically used in hospitals to reverse opioid sedation after surgery. Sometimes emergency responders use it to treat opioid overdoses. The other product is the Evzio auto-injector, made by Kaleo and approved by the FDA last year. The big problem for Evzio is the product cost: about $600, says Ed Higgins, director of JSAS Healthcare, an Asbury Park, New Jersey-based OTP. Mr. Higgins, the naloxone purchasing coordinator for OTPs and other buyers in New Jersey, has been focusing on the naloxone kits instead. “We know a lot about it, but we’re not going to buy it,” said Mr. Higgins of Evzio, noting that this auto-injector may be too expensive for OTPs and insurance companies, in light of the effectiveness of the intranasal spray. Combining a $1 million grant from the state’s Governor’s Council on Alcoholism and Drug Abuse with some federal prevention block grant money, Mr. Higgins has been able to lower the cost of the naloxone kit, usually more than $100, to $85. He also uses treatment vouchers to help pay for the initial costs of OTP treatment. “Get them inside and we have a chance,” he said.